1. White noise machine. This is one thing I had read about and randomly put on our registry having no idea how much we’d really end up loving it! If you read up on how to get your baby to sleep well, white noise/sound machines are always recommended. Kennedy LOVES this thing and it’s amazing how much white noise really does calm her. We originally had this for up in our room (in her bassinet) for nighttime use but have loved it so much that we bought another to keep in her diaper bag/car seat. It’s been amazing in the car when she’s had fussy moments, too. 2. Ollie swaddle. 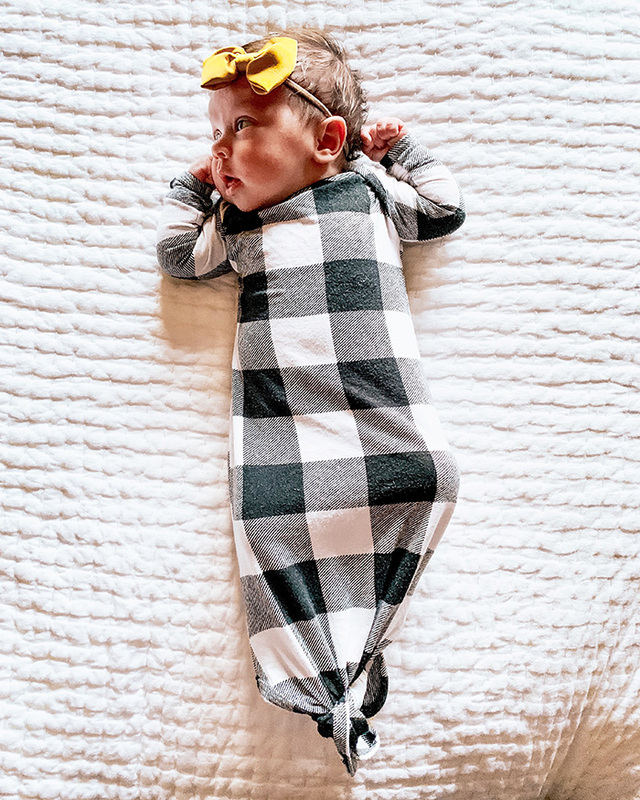 I tried my hand at a few swaddles after she grew enough that I felt comfortable experimenting with them and Ollie has definitely been my favorite so far. It’s foolproof with the Velcro design, grows with your baby (one size fits all), and gets super, super snug, so baby can’t break free. Highly recommend… especially if you’ve got a baby that always seems to wiggle their way out of a swaddle! 4. Rosie Pope diaper bag. Not only is this super pretty and feminine, it’s roomy and has great interior compartments for all the little necessities you need with a baby. It also comes with a chic bottle cooler and changing pad. Plus it’s a backpack style, which is a godsend! 5. Smilo newborn pacifiers. We held off giving Kennedy a pacificer until she was a few weeks old but once we did, I quickly realized that Smilo was going to be our favorite for this newborn stage. I’d heard that from a few other moms but can now attest to it for myself. The shape of these fits a newborn’s mouth perfectly and she can actually keep it in her mouth on her own (for the most part), which I cannot say about other pacifiers at this age. 6. Nuna Pipa car seat. I did SO much research on the whole car seat/stroller deal and finally landed on the Nuna Pipa seat and Demi Grow stroller. We’ve loved our Nuna and how easily it clips into the latched bases in both of our cars. It’s top safety rated and also one of the lightest car seats on the market, which I appreciate in particular when carrying her around on my own! My favorite feature has to be the “dream shade” which does an incredible job keeping her shielded from sunlight, weather, and strangers haha. 7. Keekaroo Peanut Changing Pad. This soft, smooth changing pad is a no fuss product that’s far less beautiful than a traditional changing pad with pretty cover but way more functional! We love how easy it is to wipe down and keep clean amidst all the diaper changes. 8. Boppy Newborn Lounger. First off, I love how lightweight and portable this lounger is. I move it all over the house and while I also love our DockATot, this is much easier to do so with. I also like how it keeps her up a bit, making it a great place for her to hang when she’s awake and looking around. 10. Comotomo Bottles. After a bit of trial and error with bottles, this one is our current favorite. Kennedy only really gets bottles when I’m gone or I know we’ll be out and about for a while. Nevertheless, this one seems to be working the best for her and is among the top recommended bottles for breastfed babies, for whatever that’s worth! PS - If you’re an Instagrammer, I would love if you’d head over to my Instagram page and participate in the holiday themed polls I’ve got going on right now. Trying to determine what kinds of holiday posts/gift guides to do for y’all this year and would love your input. PSS - If you’re NOT an Instagrammer, feel free to leave your opinions on the above subjects regarding holiday posts here in a comment for me!